Irish elk is the common name for an giant, extinct deer, Megaloceros giganteus, characterized by enormous antlers. This is the largest deer known to have ever lived. Megaloceros giganteus appeared for the first time about 400,000 years ago and disappeared about 11,000 years ago. It ranged from Ireland and Great Britain in Western Europe and as far east as China and Siberia during the Late Pleistocene. The common name of Irish elk for Megaloceros giganteus is misleading. Although large numbers of good quality skeletons have been found in Irish bogs, its range was much broader than Ireland. In addition, it is not closely related to the living species currently called elk. For these reasons, it sometimes is referred to by the common name of giant deer. The Irish elk is an important paleontological find that captured the imagination of the greatest evolutionists, who used it in debates to support various theories. Its finding in the fossil record also caused theological debate. Many seventeenth-century scientists assumed that it must still be alive in some part of the world in order to be consistent with their views that a perfect God, who made a perfect creation, would not allow any of His created organisms to become extinct. Megaloceros giganteus is a member of the deer family Cervidae, a taxon of even-toed ungulates (order Artiodactyla), that includes elk, moose, caribou or reindeer, muntjac, red deer, and white-tailed deer, among others. A characteristic of deer is that almost all species have antlers, a biological structure that is unique to deer. Other ruminants have horns. Antlers consist of bony outgrowths from the head with no covering of keratin as is found in true horns. Megaloceros giganteus was one of the largest deer that ever lived. It stood about 2.1 meters (6.9 feet) tall at the shoulders and could weigh in excess of 680 kilograms (1,500 pounds), matching the extant moose as the largest known deer (Petersen 1989). The antlers were particularly impressive—the Irish elk had the largest antlers of any known deer. They could reach to 3.65 meters (144 inches) from tip to tip and weigh up to 40 kilograms (88 pounds). This is much larger than extant species. The greatest antler spread for the North American elk (Cervus canadensis) was one that reached 161 centimeters (63.5 inches) (Petersen 1989). The largest known member of Cervidae was a North American moose (Alces alces), which stood 2.34 meters (7.7 feet) at the shoulders and weighed 825 kilograms (1,815 lb); it had an antler spread of 1.99 meters (79 inches). Alces alces, which in its native habitat of North America is known by the common name of moose, is known by the name of "elk" in Anglophone Europe. The large antlers of the moose, although small relative to the giant deer, led to Megaloceros giganteus being known as an elk. And the fact that the earliest fossil findings (and even today the best remains) come from Ireland lead to the species being dubbed the "Irish elk." (Over 100 deer skeletons have been found in the Ballybetagh Bog in Ireland alone.) However, Megaloceros giganteus was a relatively recent arrival to Ireland, first appearing somewhat about 37,000 years ago and lasting until about 32,000 years ago (IPCC 2000) and then again inhabiting Ireland during the Allerod interstadial phase at the end of the last glaciation, from about 12,000 to 11,000 years ago (IPCC 2000; Gould 1977). A significant collection of M. giganteus skeletons can be found at the Natural History Museum in Dublin. During the Pleistocene, the Irish elk ranged as far west as Ireland and Great Britain, as far south as northern Africa, and as far east as Siberia and China (Gould 1977). The latest known remains of the species have been carbon dated to the early Holocene about 11,000 years ago (Stuart et al. 2004). It possibly evolved from M. antecedens. The earlier taxon—sometimes considered a paleosubspecies M. giganteus antecedens—is similar but had more compact antlers. The earliest known drawing of antlers of giant deer date to 1588 (Gould 1977). In 1697, Dr. Thomas Molyneux provided the first published description. He noted: "Nature herself seems by the vast magnitude and stately horns, she has given this creature, to have singled it out as it were, and showed it such regard, with a design to distinguish it remarkably from the common herd of all other smaller quadrupeds." While Ireland was the location where the first fossils were discovered and described, in 1746, a skull and anthers were unearthed in Yorkshire, England (Gould 1977). 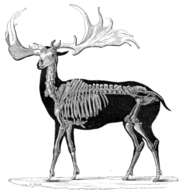 In 1781, the first discovery in continental Europe of fossils of this giant deer were made in Germany (Gould 1977). The giant deer and its massive antlers has been important in debates on evolutionary theory. Gould (1977) notes that "every great evolutionist has used the giant deer to defend his favored views." The giant deer also posed a religious/philosophical conundrum for those who professed Divine Creation of all of nature’s creatures: If God is perfect, and He made a perfect creation, why would He allow any of his created organisms to become extinct? Because of these religious concerns, even many scientists in the seventeenth and eighteenth century, when fossils were being widely discovered, denied the reality of extinction, believing that the animals depicted from the fossils were still living in remote regions. Dr. Thomas Molyneux, the naturalist who first described the Irish elk, opined: "no real species of living creatures is so utterly extinct, as to be lost entirely out of the World, since it was first created, is the opinion of many naturalists; and 'tis grounded on so good a principle of Providence taking care in general of all its animal productions, that it deserves our assent" (McSweegan 2001; Gould 1977). Not finding the Irish elk in Ireland, Dr. Molyneux concluded that it was the same animal as the American moose (Gould 1977). Georges Cuvier used the Irish elk to prove that extinction did occur, proving that it was not like any other animal and then placing it with other fossils animals with no modern counterparts, he provided evidence of the fact of extinction (Gould 1977). The size of Irish elk antlers is distinctive, and several theories have arisen as to their function and evolution. The Irish elk is seen as having arisen from forms with smaller forms. It has been various held that the giant antlers were adaptations as defensive weapons, sexual selection to attract females, and for ritualized combat. Some held that the antlers, under constant and strong sexual selection, increased in size because males were using them in combat for access to females. It has also been suggested that the antlers themselves lead to the Irish elk's demise, that eventually they increased in size so much that they became unwieldy and the Irish elk could not carry on the normal business of life, perhaps even being caught in trees. Thus, it is held, this increase in antler size lead to Irish elks becoming extinct. However, there is no reason to assume that the large antlers were not favorable adaptations rather than detrimental structures. As been noted by various individuals, such as by Julian Huxley since the 1930s, species with larger body size tend to have antlers that are more than proportionately larger, a consequence of allometry, or differential growth rate of body size and antler size during development. That is, as deer get larger, antlers do not increase in the same proportion as body size, but increase faster. Stephan Jay Gould tested this theory on the Irish elk and showed that there indeed was a strong positive correlation between body size and antler size, with the antlers increasing in size two and one-half times faster than body size (Gould 1974, 1977). Discussion of the cause of the Irish elk's extinction has tended to focus on the antlers (rather than on their overall body size), which may be due more to their impact on the observer than any actual property. 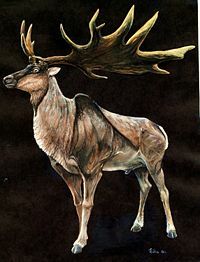 Some have suggested hunting by man was a contributing factor in the demise of the Irish elk as it was with many prehistoric megafauna, even assuming that the large antler size restricted the movement of males through forested regions or that it was by some other means a "maladaptation" (see Gould 1974). But evidence for overhunting is equivocal, and in Ireland at least, it appears that the giant deer became extinct before the impact of humans (Gould 1977). More recent research pointed out that high amounts of calcium and phosphate compounds are required to form antlers, and therefore large quantities of these minerals are required for the massive structures of the Irish elk. The males (and male deer in general) met this requirement partly from their bones, replenishing them from foodplants after the antlers were grown or reclaiming the nutrients from discarded antlers (as has been observed in extant deer). Thus, in the antler growth phase, male deer from Ireland were suffering from a condition similar to osteoporosis (Moen et al. 1999). When the climate changed at the end of the last Ice Age, the vegetation in the animal's habitat also changed towards species that presumably could not deliver sufficient amounts of the required minerals, at least in the western part of its range. The most recent specimen of M. giganteus in northern Siberia, dated to a time well after the end of the last Ice Age, shows no sign of nutrient stress. This is actually quite unsurprising, as they come from a region with continental climate where the proposed vegetation changes had not (yet) occurred (Hughes et al. 2006). In conclusion, it is easy to advance a number of hypotheses regarding the disappearance of the more localized populations of this species. The situation is less clear regarding the final demise of the Irish Elk in continental Eurasia east of the Urals however. Stuart et al. (2004) tentatively suggest that a combination of human presence along rivers and slow decrease in habitat quality in upland presented the last Irish elk with the choice of good habitat but considerable hunting pressure, or general absence of humans in suboptimal habitat. Geist, V. 1998. Deer of the World: Their Evolution, Behaviour, and Ecology. Mechanicsburg, PA: Stackpole Books. ISBN 0811704963. Gould, S.J. 1974. Origin and function of "bizarre" structures: Antler size and skull size in "Irish Elk," Megaloceros giganteus. Evolution 28(2): 191-220. Retrieved February 18, 2009. ———. 1977. The misnamed, mistreated, and misunderstood Irish elk. Pages 79-90 in S.J. Gould, Ever Since Darwin: Reflections in Natural History. New York: W. W. Norton. Hughes, S., T.J. Hayden, C.J. Douady, C. Tougard, M. Germonpré, et al. 2006. Molecular phylogeny of the extinct giant deer, Megaloceros giganteus. Molecular Phylogenetics and Evolution 40(1): 285–291. Retrieved February 18, 2009. Irish Peatland Conservation Council (IPCC). 2000. The giant irish deer: A victim of the Ice Age. Irish Peatland Conservation Council. Retrieved February 18, 2009. Lister, A.M. 1987. Megaceros or Megaloceros? The nomenclature of the giant deer. Quaternary Newsletter 52: 14-16. McSweegan, E. 2001. "Books in Brief: Nonfiction; Too late the potoroo." The New York Times November 25, 2001. Moen, R.A., J. Pastor, and Y. Cohen. 1999. Antler growth and extinction of Irish elk. Evolutionary Ecology Research 1: 235–249. Retrieved February 18, 2009. Petersen, D. 1989. Of moose, Megaloceros and miracles. Mother Earth News March/April 1989. Retrieved February 18, 2009. Stuart, A.J., P.A. Kosintsev, T. F. G. Higham, and A.M. Lister. 2004. Pleistocene to Holocene extinction dynamics in giant deer and woolly mammoth. Nature 431(7009): 684-689. PMID 15470427. Retrieved February 18, 2009. Extinct Giant Deer Survived Ice Age, Study Says National Geographic. The Case of the Irish Elk University of California at Berkeley. This page was last modified on 6 March 2018, at 00:39.